One line across Highway 101 separates two cities, Coos Bay sitting below North Bend. You could spit from one to the other. North Bend’s high school, called North Bend High School, does not have the athletic tradition of Marshfield, the Coos Bay high school. They have Mel Counts on the Olympic gold team in 1960 who won two rings with the Celtics. 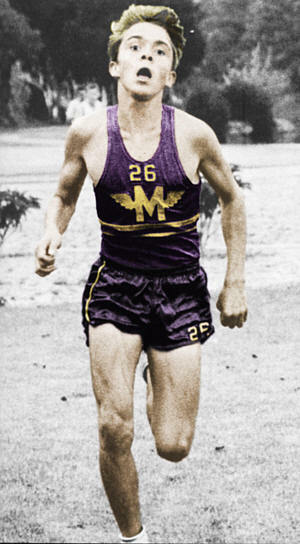 They have All-World Track Star Steve Prefontaine. Not a lot of room in that trophy case. Most every Marshfield team pounded the Bulldogs. A 54-0 football score was normal for the times. North Bend didn’t win a game for two years. During wrestling season everything turns upside down. The North Bend coach, Dave Abraham, was a national coach of the year. He took a U.S. Greco team to the Junior Worlds in Japan. His North Bend guy Robin Richards took second. We knew how to throw. The big fullback who crashes the line in football goes for a ride. Every football player/wrestler from the other teams got slammed. It was payback for 63-0. It was a reminder that football and basketball teams may take a figurative and literal beating but step on the mat and you risk flying over the scorer’s table. The duals between the two schools rotate from one to the other each year. The year it’s in the North Bend gym the Bulldogs tie the Pirates at the next to last match. I wasn’t pepped. The guy was going to wipe me out. Don’t get pinned? My match was over, the dual lost. But I still had to wrestle. We walk out and shake hands. He throws mine back in my face. I give myself a bloody nose and take a cotton-packing timeout. At the first whistle he pummels the top of my head like a speed bag. My headgear slides down and blinds me while he form-tackles me into the mat. It’s a quarterback sack and I’m the bag. The ref stops the match to give me a point for taking shots to the head and we start over. You’ve heard how cramming for a test leaves the last thing you read as the first thing you remember the next day? I’d learned a drag-trip (fourth clip down) the day before. I stood there with nothing else so I closed my eyes and dove in. The drag cleared his lead arm and my baseball slide-like trip leg snaked an ankle. I was so revved that I slid by him with my leg hook and opened my eyes to his feet close together. Since my head was near his knee I pushed on it and tipped him sideways. We did the same thing three more times before he quit trying to escape. This is where things changed. I’d been afraid. I didn’t want the sacrificial lamb role but I’d earned it. Someone had to lose to the good guy. Since I’d lost to all their other guys near the weight class the coach figured I could do it again but not get pinned. Except it’s the second round and I’m winning. Better than that, my frightening opponent is gassed. I feel the power of wrestling for the first time. I trap his head against the mat with a forearm and do slow motion cross-faces, pushing a fist into a face that can’t escape. I don’t try to pin, just grinding his grill for a round and a half. It got messy. Both of us left a few things on the mat. He quit sports and started drama club. I left any doubts that wrestling can change people. If you are not the top seed it doesn’t mean you can’t win. If you are unranked you still wrestle. In a match-up of styles any day might be your day. Draw your line in the sand and change your world, starting with you. Or if you panic like I did, jump in there with the best you’ve got. I like to think my younger brother Steve Gillaspie was in the gym that night and got inspired toward the coaching career that took him into the National Wrestling Hall of Fame. He’s writing a book about Alaskan wrestling that you’ll hear about. Since I went to Alaska for the Mount Marathon Adventure Race with him I hope to get in it.